This entry was posted in USA Immigration and tagged Apply for a US Visa live and work in usa USA to work Work in USA on June 27, 2016 by Blog Author. Here are 10 ways to go to USA. According to Forbes, these are the top companies that sponsor immigrants to work in USA. On number-10, there is Mahindra Satyam who hired 2,310 workers to work in USA. It is an Indian company with multiple branches across the globe. While it seems like Ernst & Young only operates in America, it actually has three offices in Kerala alone. 2,316 workers have gone to USA to work through this company, placing it at number-9. Endorsed by Tiger Woods, Accenture is a global giant with 2,653 placed in USA by them. At number-8, Accenture has its offices worldwide and many of them in the major cities of India. At number-7 we have Larsen & Tubro who expanded beyond construction and set up L&T Infotech. They have 3,253 foreign employees working out of their US offices. Number-6 is Microsoft. This company that revolutionized computers, has established itself in various countries and has 4,067 people working in the US. Deloitte Consulting at number-5 employed 4,735 workers from other countries to work in their US offices. They have set up multiple branches in India as well. IBM is the grandfather of computers stands at number-4. IBM brought 6,190 foreigners to work for them in the USA. Tata Consulting Services, part of the Tata empire, has 6,732 non-Americans working out of America. They have their business processes set up in other countries like South Africa and UK. They are at number-3. Wipro at number-2 is one of the biggest IT and ITES company of India. They have sent 7,178 employees to work from USA on various projects. Infosys bags the top place for hiring the most number of international workers placed in USA. 15,800 employees of Infosys work out of USA offices. 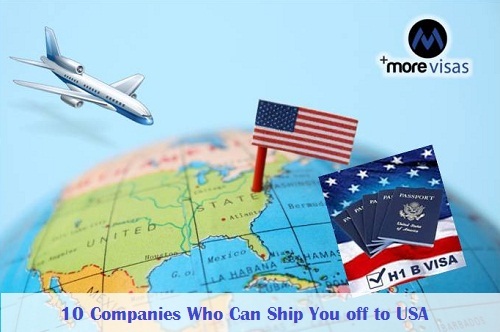 Here are a few companies you can work with who might send you to the USA to work. They mostly send their employees on an L1 or H1-B visa. For more information on visas, please visit morevisas.com.